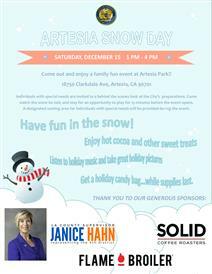 The City has planned a Snow Day at Artesia Park from 1pm to 4pm! Come enjoy Christmas music, hot chocolate and treats, a visit from Santa, and Snow play! Bring your mittens and gloves! We’ll have some photo opportunities for the whole family too! In addition, we will offer a Special Needs snow play opportunity at 12:45pm and then snow play for all from 1-4pm. 15 tons of white fluffy fun! Use #ArtesiaSnowDay for your Facebook pictures and we’ll announce a prize winning picture!